Why I love the Emjoi Micro Pedi. Rejoice, Rejoice. My feet a less ugly today – and it’s all to do with a magical device called the Emjoi Micro Pedi. You see I have a confession – I have extremely ugly feet. I ruined them with high heels many years ago and the fact that I spend a lot of time in flip flops because of this means I suffer dreadfully from hard skin on my feet – and nothing every really sorted it out until recently. My realisation that I didn’t have to live with ugly feet forever began with a device called the Ped Egg. I had seen this magical implement on US TV while on holiday and was fascinated. Not exactly being ‘pretty of heel’ not only did this thing cheese grate away the nastiness, I could see exactly how much was removed. As someone who will only vacuum with a Dyson as you can actually see how much dust you’re sucking up and therefore exactly what affect all that pushing backwards and forwards is doing, this was brilliant. I decided I must own one immediately. The problem was at the time, I was living in Australia and the price to purchase a Ped Egg in that fair country then involved three cash installments. Honestly, I could have bought new feet for what they were charging. Thankfully though I was working for British magazines so a swift call to a relevant press office meant not one, but five shiny new Ped Eggs made their way across the sea for testing. One of my friends even has me listed as Helen PedEgg on her email as the first night she met me I was bestowing shiny foot polishers on friends like a crazed skin-removing Santa. I loved my PedEgg…… nothing I’ve tested before or since ever came close to its foot smoothing powers – until now. The Emjoi Micro Pedi, is effectively an electric sander for your feet. Put the gritty roller on the hard skin, turn it on and hey presto the dead skin is buffed away. They say it should take a minute or two – to be honest, it was more like five for me (I had neglected the task for a while) but it left my heels ridiculously smooth. I don’t think it’s as good as the Ped Egg on the side of toes or that bit in the middle of your foot that hardens up if you wear stupidly high heels , but the fact that there aren’t any rules about not using it on damp skin may mean I’m more likely to use it more regularly and so they might not build up so much. The other downside is that it kicks up a lot of dust – dust that is made up of feet, dust that if you suffer minor asthma will also make you wheeze. I’m not sure how to get round that bit. Although at least now I know why my chiropodist wears a face mask!!! 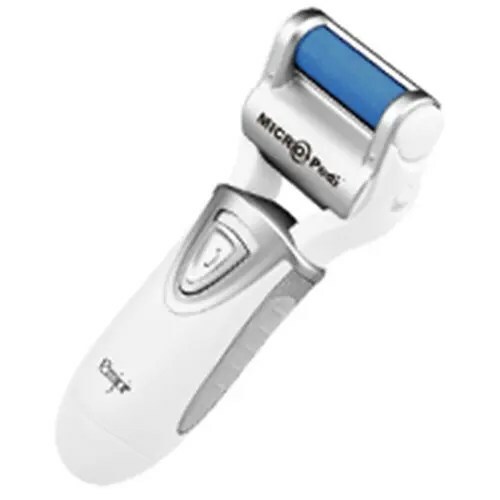 Since I wrote this post, the Emjoi Micro Pedi has been supplemented in my affections. I still absolutely love it but if you want the absolute best ‘go nuclear’ on your hard skin option, you need to try something called Footner Exfoliating Socks. Here’s what happened when I tried them. Honestly, they are amazing. I still use the Emjoi Micro Pedi to keep things under control though. If you want to give it a try, it’s available at Holland and Barrett online. This post contains affiliate links – however, I originally wrote this post before I knew such things even existed so you can be assured that my gleeful raptures over the Emjoi Micro Pedi are most definitely independent!